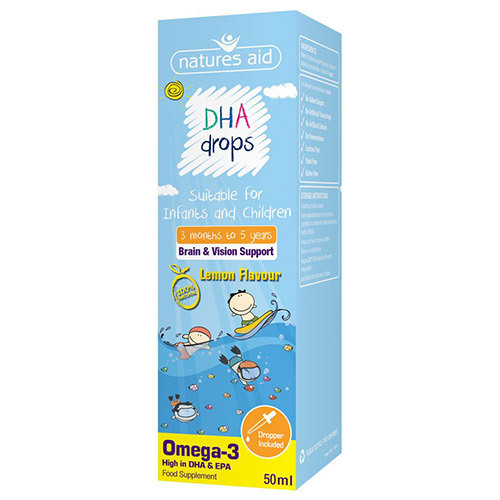 Natures Aid lemon flavour DHA drops have been specifically designed for breastfed babies, infants and children. 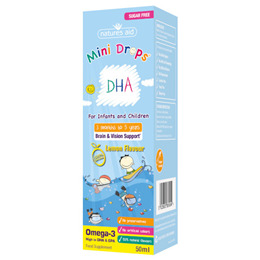 The DHA drops provide high levels of Omega-3 fatty acids DHA & EPA, which contribute to normal brain and vision development in children. The fish used in Natures Aid DHA drops are derived from Cod, Coley and Haddock. They are sustainably sourced from the cleanest waters of the Arctic Ocean and are Marine Stewardship Council (MSC) certified, providing consumers with a guarantee of sustainability and full traceability. The fish oil has been molecularly distilled to remove pollutants, such as heavy metals (including mercury), dioxins and PCB’s to ensure ultimate purity. Below are reviews of Natures Aid DHA - Children & Infants - 50ml by bodykind customers. If you have tried this product we'd love to hear what you think so please leave a review.